A taut political thriller from ITC, the people behind Space 1999, in which a police officer played by Franco Nero learns, during an investigation of the murder of a high ranking officer, of an attempted fascist coup. The title refers to a calling card left upon a body that suggests a link with the leader of a war time partisan band known simply as The Salamander. 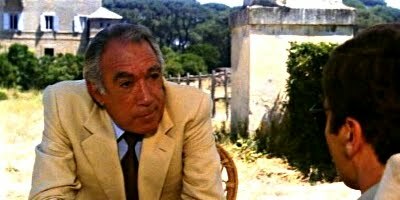 A strong cast includes Anthony Quinn, Martin Balsam, Sybil Danning, John Steiner, Claudia Cardinale, Eli Wallach and Christopher Lee. Penned by The Twilight Zone's Rod Serling and based on a 1973 novel by Morris Langlo West, the father of Man From Delmonte vocalist Mike West, the film would surely be agreeable to those who delight in political conspiracy fare such as Slap the Monster on Page One or I as in Icarus. The soundtrack is provided by the proflific Jerry Goldsmith and direction is by Oscar winning Godfather and Tintorera... Bloody Waters editor Peter Zinner.